﻿ FLAC Splitter - How to split FLAC files based on CUE on Mac and PC? Home » audio » How to Split FLAC files based on CUE on PC and Mac? If your FLAC file is one big file which contains multiple tracks, for some reason you just need each song/music in single track. Now with the help of Bigasoft FLAC Splitter, it's just so easy to split FLAC files if your FLAC file is equipped or associated with a CUE file as well as convert FLAC files on Mac and PC. 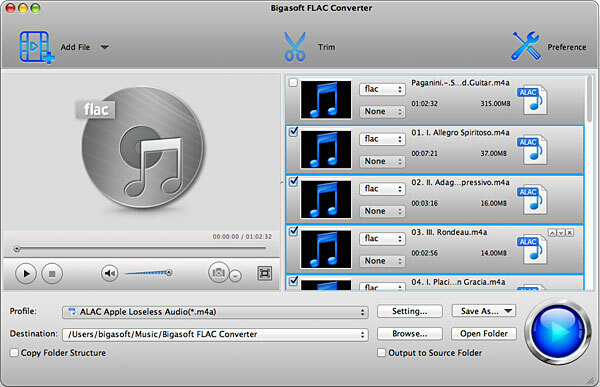 Bigasoft FLAC Converter, working as a professional FLAC CUE splitter and FLAC Converter, can fast load numerous FLAC files and split them to multiple tracks based on associated .cue file in batch. In addition to split FLAC files, Bigasoft FLAC Converter can also convert the FLAC files to popular audio formats like M4A, WAV, 24 bit WAV, MP3 up to 320kbps, Apple Lossless ALAC, AIFF, OGG, etc. Detailed guide on how to Split FLAC files based on CUE on Mac and PC and Convert to Desired Audio Format? 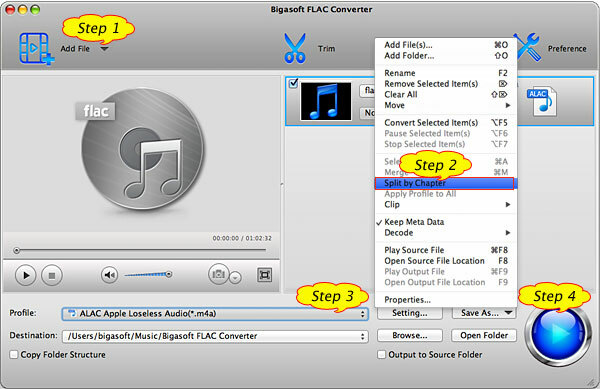 Free download Bigasoft FLAC Converter (Mac Version, Windows Version). Install and launch it. After installation, the Windows version FLAC Converter will launch automatically. 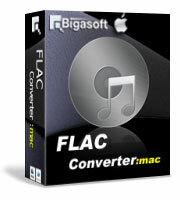 For Mac users, you will need to go to Application to launch Bigasoft FLAC Converter Mac version. Click "Add files" to browse and open FLAC files which you want to split and convert. After all your long FLAC files are loaded, select all your FLAC files (press Ctrl+A or Command on Mac computer). For Windows users, right click the mouse to open the context menu. For Mac users, press Ctrl and click the mouse to open the context menu. Click "Split by Chapter" in the context menu in the task list, the long and large FLAC files will be automatically split to tracks. Tips: To ensure Bigasoft FLAC Converter can split your FLAC files, the .cue files shall be in the same folder with your FLAC files. Now the FLAC files are split to multiple tracks. Take converting FLAC to ALAC format for example. Click the "Profile" Drop-down list and search "alac" in the "search profile" box. Select ALAC - Apple Lossless Audio Codec (*.m4a) as the profile. Click "Browse" to choose the folder where you want to put the converted FLAC files. To convert FLAC to 320kbps MP3, after setting profile as MP3 - MPEG Layer-3 Audio (*.mp3), click "Settings" to open the "Advanced Setting" window and adjust audio bitrate to 320. To convert FLAC to 24bit WAV, after setting profile as WAV - Waveform Audio (*.wav), click "Settings" to open the "Advanced Setting" window and change audio codec to pcm_s24le. Press on the big blue "Convert" button. Bigasoft FLAC Converter will start splitting FLAC to single tracks as well as convert FLAC to desired audio formats. It is just that easy to convert and split FLAC on Mac and PC. Not only can Bigasoft FLAC Converter split and convert FLAC files, it also supports splitting and converting many other audio formats as you wish. Free download your copy to start enjoy now.